I am bummed. My 12+ year old RSW 15 has died. If I leave it plugged in and switched off for a few minutes and then switch it on - I get a brief red light (less than a second) and then nothing. Sometimes if I leave it plugged in and switched on - the red light will come on and stay on after about 30 to 45 minutes. Will never go green - and, obviously, no sound. Any ideas? Worth fixing? This beast has been the cornerstone of our HT setup since we bought it (along with RF7s, RC7 and RS7s). It has been driven by a Yamaha RX-Z1 and now a Denon 4311Ci (the Z1 kicks the Denon's behind btw). Dilema: what to replace the RSW 15 with? Does not have to be Klipsch - do they even have a comparable or better model today? What other brands/models do y'all suggest? 95+% of our HT use is movies. Id d get the RSW-15 repaired. Sent the parts off, came back in working order, reinstalled them and am good to go. Very happy. I also moved the position of the sub from a sub-optimal side facing (across the room, parallel to the seating position) to the corner next to one of the RF-7s. Wowza. What a difference that makes. I am having to take pictures off of the walls now :-) else they rattle too much. On a side note, I am replacing my Denon 4311Ci AVR with a Yamaha RX-A3060. A Christmas present from the wifey. Keen to see how that fits in with everything. The Denon 4311Ci replaced a Yamaha RX-Z1(which I still have) - was never overly impressed with the Denon. Going back to Yammy. Please report back about the Yamaha 3060. If I decide not to add the new VM300(4K/HDR/2.2/etc) module to my NAD T175HD pre/pro, I may just go the Yamaha 3060 route or their 5100 pre/pro. The Yamaha sounds great with movies, the Denon was not bad but I felt it lacked something when it replaced the RX-Z1. The 3060 seems louder than the Denon - seems to put out more decibels at the same volume setting - this is what I remember when I replaced the RX-Z1. One of the main motivators to replace the Denon was getting ready for a 4k TV this year and a nice bonus is the fact that my wife can play her Spotify thru the receiver with ease. I gotta say she does give the system a workout when she cranks up the volume when listening to Rammstein - the RSW-15 sounds awesome here. I am in a similar boat as you were with an RSW-15 that has a bad amp. Been looking at Edwards Electronics as well for the repair, based on your review! When I looked at the place Klipsch recommended, Sybesma in MI, they wanted about $300, with no guarantee of repair! After seeing your great success with Edwards, I'd like to use them. I contacted them by email and phone (left a message) but haven't heard back yet. I guess I'd like to talk to somebody there to get a "warm fuzzy feeling" before blindly sending my parts over there. My question now that you've had it back for some time, how is it working for you? Would you think buying the extra year of warranty is worth it for this sub? Just got my RSW 15 amp back from Edwards and I am back to booming.. Took right at month to get repaired. $160 = shipping to save my sub was worth it. Good deal, glad to see another positive review for Edwards and nice to know these old subs are still serviceable. Thanks waddisme! That's great to hear. I finally got my sub back from the speaker shop and took it apart. Actually purchased the sub repair with Edwards last night. Going to send out today. Hope it does the trick! When I pulled the input panel off I was able to discover that there was a lot of damage to the buttons and knobs... damage I'm assuming happened during shipping when I first received the sub. Hope Edwards can repair this too! I'll update with my experience when I get it back. Late reply - sorry for that. Sub working great, money well spent. I did relocate it when I got it working. Sounds better than ever - that is the location, more in the corner of the room now as opposed to the side. @amstaff do you remember how you contacted edwards electronics on Ebay? i can't seem to currently. i have the same issue as you had and that is a good deal to get it fixed. Id like some sort of interaction before i blinding send a part off with $165 tape to it. Just traded for a near mint cherry RSW-15. Hadnt even had a chance to put it through its paces. One reason i was willing to trade ( pair of well travelled cornwalls) was the ability to have the amp repaired for so cheap if needed. I simply contacted the seller on Ebay - I got a quick response. Turn time of the parts was as advertised - maybe a few days sooner. I had read good reviews about EE before I went with them. Sub is still running as good as ever. 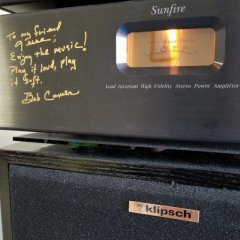 Just wanted to update with my sub... got back the amp and input panel from Edwards, right at about a month from the date they received it. I did an initial setup, with nothing bolted back into the box yet (except for the amp) to make sure a basic connection was working. The driver seemed to be playing my source material, so I disconnected everything and put the sub back together. Re-connected the power and input lines, and the sub kicked on and is back to working! I'm so stoked to have this thing working with my system now, and Edwards did an amazing job with the repair! My input panel had some heavy damage to it, but he was also able to replace all the knobs and switches, and everything works flawlessly now I am one very satisfied customer, and look forward to several more years of enjoying this sub. Definitely recommend Edwards for any electronics repair you need! I do have question for the more experienced guys though. I currently have my HT system running through a surge protector that is controlled by a remote outlet. This way I can technically leave everything plugged into in the "ON" position and have it all turn on or off via the outlet remote. I noticed that with the sub, if I have it in "auto-on enable" on that it doesn't work when the sub is turned back on with the system. It's only in sleep mode and to activate it I have to re-plug in the RCA input. BUT, if turn "auto-on" off and just leave all the power flow dictated by the remote outlet, the LED status is green and ready to go with no problems. Once figuring this out I've been running it for the last week or so. does have a auto shut down of not . If it's shut down less things to go wrong !